Pink is everywhere in October, bringing awareness to the fight against breast cancer. As part of Breast Cancer Awareness Month, I’m joining 10 other designers in blog hop featuring DIY projects to inspire hope and the “Hope” Rollograph wheel (designed by Jen Goode). 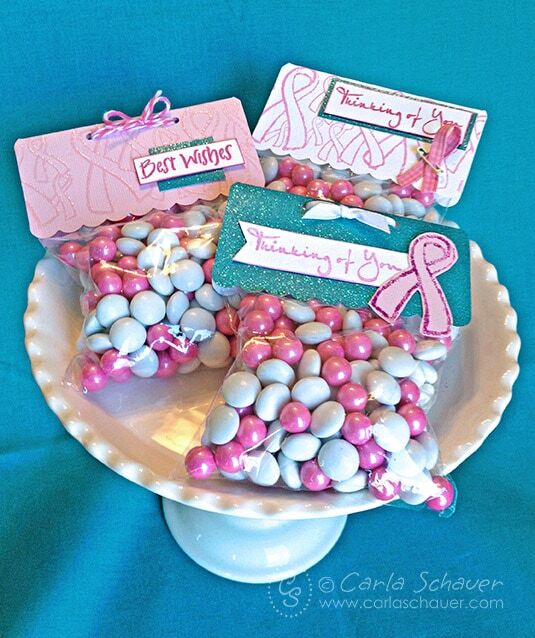 For my DIY project contribution, I created toppers for little “thinking of you” treat bags. I used the “Hope” stamping wheel in a few different ways to make the toppers. Each of the toppers was die cut from cardstock. I created the ribbon design on the pink treat topper by stamping the ribbon design with Clearsnap Watermark Sparkle ink and heat embossing with clear powder. A stamped sentiment, aqua glitter cardstock and bakers’ twine finish the topper. The white topper was stamped using the “Hope” wheel and Pink Crafters’ Ink (Clearsnap). I accented the stamped topper with aqua glitter cardstock, astamped sentiment, and a pink checked ribbon. The final topper received a pink stamped and glittered ribbon accent. I stamped the ribbon design onto pink cardstock using pink Crafter’s Ink and sprinkled glitter over the ink. Once the ink was heat set, I cut out the single ribbon from the design with fine tipped scissors and added it to the topper with a stamped sentiment and white satin ribbon. Find out more information about the “Hope” Rollagraph Wheel, and download Jen Goode’s free “Fight like a girl” printables. Enter to win a prize package featuring the “Hope” Rollagraph Wheel and make sure to check out the other DIY Pink Ribbon Projects to inspire Hope using the links below.